“Don’t worry the Insurance company will pay!” – Oh yeah, really? Insurance companies are beginning to look hard and long at pilot proficiency and decision making and why they should foot the bill for incompetence or inapt behavior and performance reaching on the wrong side of the recommended practice curve. Put it this way – would you really pay a tradesman for incompetent work done on your home? Would you not dispute paying a doctor who caused you further pain instead of relief caused by incompetent or mal-practice? THIS IS WHAT BIG TROUBLE & LAW SUITS ARE MADE OF! Why did all of this happen? – firstly because you failed to fly a stabilized approach down to an acceptable predetermined Touch Down Zone and then when things were going really not too right you failed to decide to execute a Go – Around! Now there are two main things going on here amongst many others . · The one is the possible inability to fly a stabilized and well controlled approach – which falls into the category of inadequate aircraft handling skills. Now which do you think are the worse of the two evils? I think by far the latter. The first can be dealt with by accepting the fact that you need a little dual instruction with a ‘GOOD’ Instructor. This is a competency training and aircraft handling skills issue which can mostly be dealt with easily if the problem is recognized and acknowledged by the individual and pride and a sensitive Ego is put aside. Statistics show that ‘unstabilized approaches’ are cited as being a causal factor in a very large percentage of approach and landing accidents and serious incidents world wide – a major contributor to accidents indeed! 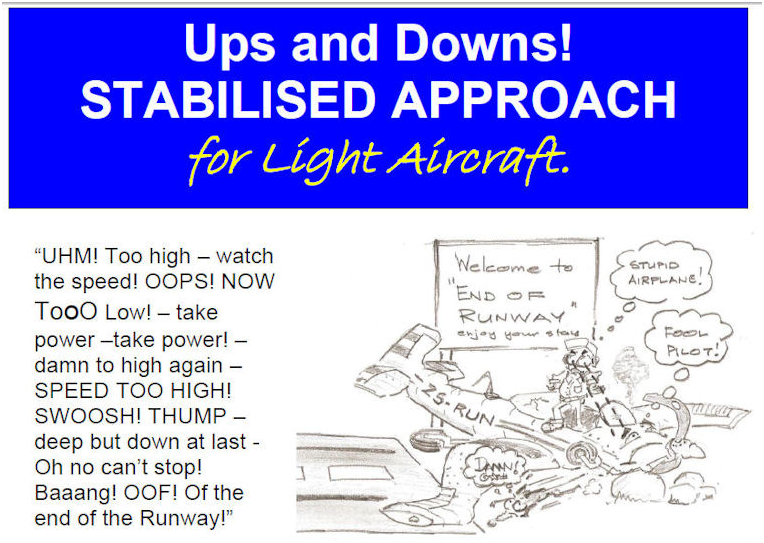 Runway excursions caused by loss of control and poor aircraft handling techniques are frequent – landing short of the runway, departing the runway or over-running the end of the runway and even stalling on final approach. All you have to do is delve into accident and incident reports to verify this fact. The diagram may be exaggerated but true enough to a lesser degree in the actual flight environment to be the cause of a landing accident or runway excursion! What is a Stabilized Approach? A STABILISED APPROACH is an approach which meets with the following parameters and thus ensures that the aircraft will arrive in a controlled manner at a predetermined point of touch down on a runway at a prescribed speed in order that landing performance can be assured and met. · Appropriate Rate of Descent taking atmospheric conditions into account. · Constant Approach Angle (glide slope). · Maintenance of alignment with the runway centre line taking wind drift into account. · Aircraft status is as required. A stabilized approach can be flown consistently and accurately if a little practice and thought is given to the principals involved. POWER (engine power – thrust) + CONFIGURATION (flaps, undercarriage etc.) + ATTITUDE (pitch attitude- angle of attack) = PERFORMANCE (Speed, rate and angle of climb, rate and angle of descent, fuel burn etc). For this discussion the performance we are looking for is Speed and Rate of Descent. How does this apply to flying a stabilized approach? Simple – now if flying a certain aeroplane type we were to apply a power setting of say 14 inches of manifold pressure with the propeller lever fully forward or say 1,500rpm on a simpler aircraft not fitted with a constant speed propeller unit and then were to select say second stage flap and then trimmed the aircraft to maintain the recommended approach speed the aircraft would descend at a given Rate of Descent depending on the aircraft type. Note that by making these changes, POWER reduction + CONFIGURATION flap second stage + ATTITUDE = a NEW PERFORMANCE is acquired in terms of a RATE of DESCENT at a selected SPEED. Now if we were to establish on final approach in our light aircraft at say 500 foot above threshold elevation at approximately 1.5 Nautical Miles from the Threshold of the landing runway then a constant 3º degree approach angle (glide slope) would be needed to reach the threshold. To do this a constant rate of descent would be required! SO WHAT IS THIS BALL PARK RATE OF DESCENT? Rule of Thumb: Ground Speed x 5 = Rate of descent for a 3º glide slope. 60G/S X 5 = 300′ foot per minute. Of course the required Rate of Descent will vary from aircraft to aircraft depending on the recommended approach speed for different load configurations. Also this rule of thumb considers Ground Speed and adjustments will have to be made for headwind and tailwind components. Once we’ve established what the Power setting is for the configuration in order to yield the required Rate of Descent & Speed (performance) then we can use it as a ‘ball park’ or ‘bench mark’ power setting to work around. A 3º degree approach angle or thereabouts is something that cannot be measured unless when flying an I.L.S approach but in the visual environment is something we get used to as a normal and comfortable glide slope for approaches but it takes a little practice to get the picture right. 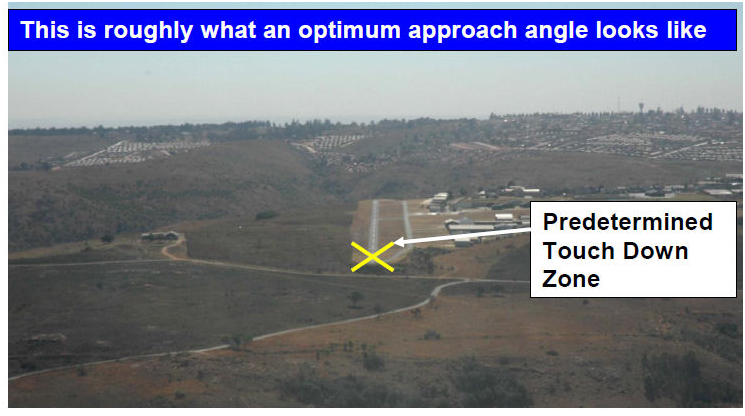 The art is to have a mental picture of what this optimum approach angle looks like to reach the predetermined touch down zone and then once established to work around the ‘ball park’ power setting making small changes in power settings and pitch attitude to adjust for being slightly too high or too low or too fast or slow and then also to compensate for atmospheric conditions such as updrafts and downdrafts etc. Not to mention good trimming techniques. This is much better than making all kinds of random and erratic power changes and at least now we have a starting point to work from and the passengers will love us for the smooth ride and good landing that follows! Good energy management is what its all about! I’ve often heard pilots say that landing close to a mark is a matter of luck! – I tend to disagree with this. If the right techniques are used which definitely include flying a stabilized approach then it’s amazing how ones luck improves – the harder you work the luckier you get! A good approach usually results in a good and safe arrival! Remember that it’s the trait of a good pilot to commence a go-around if all is not well on the approach! 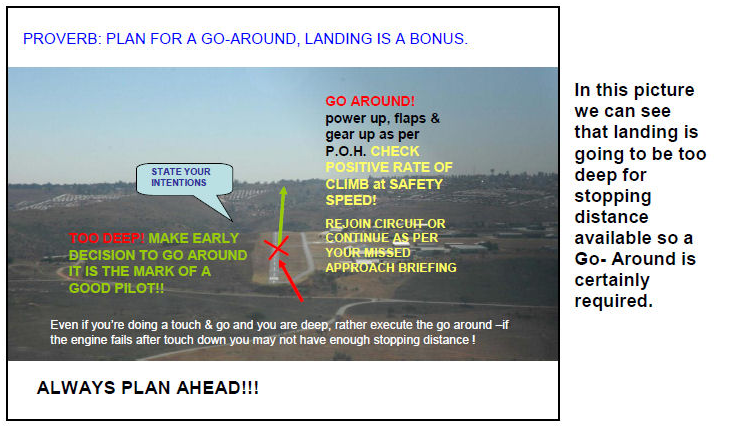 The mindset should be that landing is a bonus and that a go-around must always be briefed and planned for! Until next we meet get out there and practice those stabilized approaches – the aim is to strive for consistency of performance!